Loading Dock Equipment, Supplies & Accessories. The loading dock is the sharp end of any company's operations, the place where your business meets the outside world. Investing in the right loading dock equipment on hand for loading and unloading deliveries means that the goods will arrive at their final destination in the best possible condition, and that will translate into savings. There are numerous components that go into making the distribution operation run smoothly, and all of the different parts of the jigsaw fit together to make the operation more efficient, and safer, reducing the incidence of accidents, increasing the protection offered to both goods and staff, and also make the whole loading and unloading process a lot faster. One of the most important pieces of loading dock equipment that your business will invest in is the dock seal or shelter. The idea behind a dock seal is to allow for loading and unloading to take place in all weather conditions. The truck will be able to reverse right back up to the wall, and into the shelter, allowing staff to get access to the back without worrying about slipping on wet surfaces. In situations where the dock is not at the same level as the bed of trucks that need to be loaded and unloaded, there are a number of different solutions available to make the loading process as simple and convenient as possible. The simplest option available is a dock board. Easy Rack offer a number of different options to make sure that the loading dock equipment that you buy is right for your business. 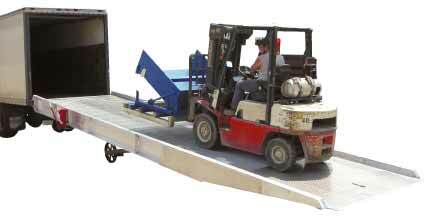 From the simplest ramp through to heavy weight units that are able to carry the weight of a forklift. The Dock board stretches between the dock and the back of the truck and allows for easy access. In situations where the height of the truck beds on delivery vehicle varies greatly from the dock and where it is important to get the fastest possible turnaround on deliveries, then a dock leveler is the ideal piece of loading dock equipment. With a high powered lift and the capacity to support particularly heavy weights such as fork lifts, dock levelers will allow for a flexible system to be installed that will allow your distribution center to accommodate a wide range of different vehicles. When a dock is unavailable, loading need not be inhibited. Under circumstances where you lack the capacity to load a truck through the dock, aluminum and steel yard ramps will allow for easy access to the rear of the vehicle from ground level. Other pieces of loading dock equipment that are considered essential include trailer stabilizing jacks that can be used to keep trailers steady and level after the tractor has been released, and chocks to stop vehicles from moving and causing problems. For lifting equipment and materials into a truck from ground level, a truck scissor dock lift is the perfect solution, and versions able to carry up to 12,000lb are available. IN order to ensure that material loaded into the rear of a truck or container is safe in transit, having a good stock of cargo bars that can be fitted in a variety of different trucks is essential, and ensures that your business is able to avoid costs incurred from goods being damaged in transit. As you continue to read through our selection of Loading Dock Equipment, keep in mind we stand ready to answer any questions you may have about our offerings. Call us at 1-888-776-3720 whenever such questions arise and let us help you make the best investment within your budget. We are located in <?xml:namespace prefix = st1 ns = "urn:schemas-microsoft-com:office:smarttags" />Houston, Texas. Easy Rack carries a wide variety of commercial shelving, material handling equipment, commercial lighting, used pallet racks, and modular prefab buildings installed nationwide. If you can not find what you are looking for call us toll free at 1-888-776-3720 and we will find it for you. Our home office is located in <?xml:namespace prefix = ns0 ns = "urn:schemas-microsoft-com:office:smarttags" />Houston, Texas with regional distribution centers located in all 50 States including New York NY, Los Angeles CA, Miami, FL. Chicago, IL. Denver CO., Dallas TX, San Antonio, TX, Austin, TX, Boise ID, Atlanta GA, Albuquerque NM, Raleigh-Durham NC, Washington DC, Albuquerque NM, Huntsville AL, Fayetteville AR, Norfolk VA , Madison WI, Jersey City, NJ Newark, New Jersey. Many people assume that the only strong loading dock ramps are made from steel. This is more of a myth than an actuality. 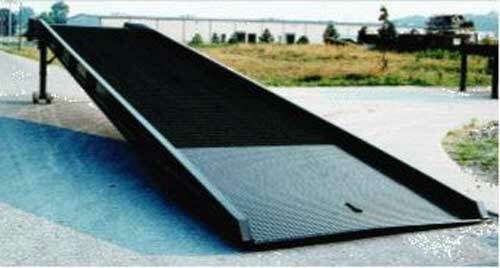 Aluminum ramps can be constructed to handle an enormous amount of weight and traffic. Easy Rack edge of dock levelers can handle capacities ranging from 20,000 to 25,000 pounds. They are easy to position by lifting a self-storing handle and pulling the handle to the dock floor. Some facilities, such as construction sites, lack a loading dock with a permanent, concrete loading dock ramp. In essence, a loading dock leveler is a flat panel at the front edge of the loading dock that can lift or drop in height to provide a smooth ramp into the back of a truck. Dock Loading Equipment, Ramps, Accessories & Supplies. The main goals of selecting dock equipment are to increase the efficiency and safety of the dispatch area so that any potential damage is minimized. Loading Dock Equipment. In order to improve the safety levels offered on your dock, a wide variety of safety oriented loading dock equipment is available.